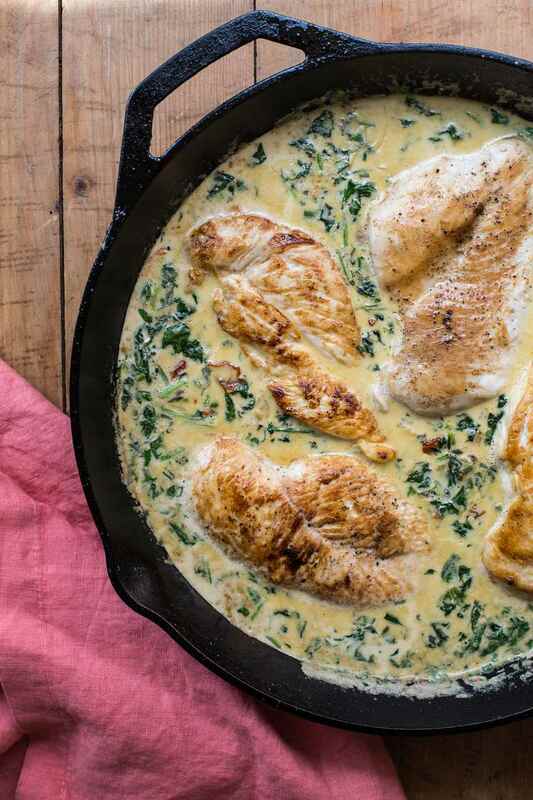 This skillet chicken has a delicious sauce, perfect for soaking bread or a side. If you wanted to perk this up with a bit of heat you could add some Sriracha sauce or other hot sauce to the simmering spinach mixture. Use any kind of mushrooms you like, and feel free to switch up the greens. Chopped collard greens or baby kale would be good here as well. You could also add in a few tablespoons of Parmesan or Fontina or another more flavorful cheese along with the creamy mozzarella. Serve this with something to soak up the luscious sauce, like rice, potatoes, pasta, or grains, and you can add a salad, but there are quite a few vegetables built right into this dish! It also reheats nicely over medium low heat. Heat a large heavy skillet, such as cast iron, over medium high heat and cook the bacon until crisp, about 4 minutes per side. Remove with tongs to a plate lined with paper towels, and pour off all but about 2 teaspoons of the bacon fat. Return the pan to medium high heat and sauté the onions and the mushrooms until golden brown, about 7 minutes. Season with salt and pepper, and remove them to a platter (you will also hold the chicken breasts on this platter). Return the skillet once more to medium high heat, add the olive oil and sauté the chicken thighs for about 8 minutes on each side until nicely browned, but not quite cooked through. Remove them to the platter next to the sautéed mushrooms and onions. Back on the heat the skillet goes, and add the spinach. Sauté for 2 minutes, until the spinach is wilted, then add the cream and broth and bring to a simmer. Season with salt and pepper, then stir in the mozzarella and continue to stir until the cheese is melted. While the spinach is cooking, chop the cooked bacon. Stir the bacon, along with the cooked mushrooms and onions into the sauce. Tuck the browned chicken thighs into the simmering sauce and continue to cook over medium heat until the chicken is cooked through, about 5 minutes more. Serve from the pan. No matter what chicken dish you're making, if you're working with frozen chicken, you should learn how to safely thaw frozen chicken so that it cooks evenly. Also try these other chicken dishes. An amazing sauce can make the dish, like this Chicken with Arugula and Mustard Pan Sauce and Pan Seared Chicken Breasts with Roasted Tomatillo Salsa.